In a study published by the British Medical Journal, chronic back pain sufferers who took 24 Alexander Technique lessons reduced back pain by 85%. I want to say how much the Alexander Technique has helped me with herniated disks in my lower back. Until I made a commitment to the technique after becoming Lindsay’s student in the summer of 2007, they were a recurring problem and each time I re-herniated them the technique gave me immediate relief from the discomfort. However, since being Lindsay’s regular student, I have not re-herniated them. According Reader's Digest, back pain is "a major drain on the American economy, costing more than $90 billion a year in medical bills." The Alexander Technique provides an effective, alternative approach to common treatments by simply addressing how the back-pain sufferer is using his/her body. What often causes lower back pain? The source of pain in the lower back tends to come from strain in the neck and upper back, as well as excess tension in the legs. To put it simply, the lower back gets compressed by everything going on around it. It's the victim rather than the culprit. In a large-scale randomized, controlled study published in 2008 in the British Medical Journal, chronic back pain sufferers who took 24 Alexander Technique lessons reduced back pain by 85%. At the end of the year, participants in the study who'd had no intervention suffered an average of 21 days of back pain per month. Those who'd had 24 Alexander Technique lessons reduced the number of days of pain per month to 3. 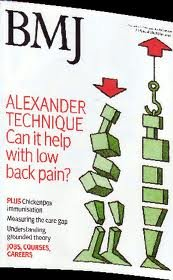 The study demonstrates that the Alexander Technique is both a highly effective and cost-effective method of significantly reducing back pain. To read the Abstract of the study, click here.